Check the job description, even if you’re not a 100% fit we’d like to hear from you. Add a note to your CV that explains why we should consider your application if your CV doesn’t match the job requirements fully. Make sure your CV is well-prepared and structured. Our office language is English, so make sure your CV is in English when you apply. We answer all applications personally within 1-3 business days. During a short Skype call, we want to get to know you a bit better and explain you in person what we’re looking for. During the first interview, we want to tell you more about what we do and how we work. Next to that, we want to get to know you better and figure out if you fit the company culture. If you are applying for a developer role, during the first interview we will also present you with a technical test to complete. Before the second interview, we generally ask you to complete a task in Wordapp where you answer some questions and situations. This not only gives us some material to use during the second interview, it also gives you a chance to use the app. During the second interview, we focus more on the job description of the job you applied for. We will focus on asking questions that give us a better understanding if you can do this job or not. If we decide to move on to the third interview, we will ask you for references as well for a reference check. During the final interview, you meet with the CEO or one of our more senior team members. 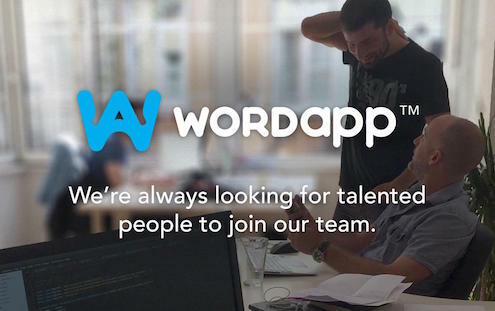 Besides for him/her to get to know you and drill you on how suitable you are for the job, we also want to understand how you see your future at Wordapp. As a startup, we’re always changing, as do our job descriptions. If all goes well we make an offer on the spot where we discuss your (salary) package as well. The entire recruiting process is not only for us to feel you are the right hire, it is also for you to decide if we are the company you want to work for. If you have questions, doubts or feel like you don’t want to continue the process please let us know. Good luck with your application and hopefully we will be able to call you our new team member soon! Questions? Use the live chat to get in touch with us.